The latest edition of this popular kids series finds Mickey and Daffy lost down the rabbit hole. Mixing education with slapstick humour, it's all kind of charming, though I imagine the enjoyment factor decreases exponentially with age. The premise this time is that it's Disney's birthday. Daffy has kindly bought her a cuckoo clock as a present, but the pesky cuckoo bird has different ideas. The cuckoo, who apparently takes after Alice, fells and escapes into an alternate dimension, Wonderland. Mickey and Daffy, naturally, follow in pursuit. 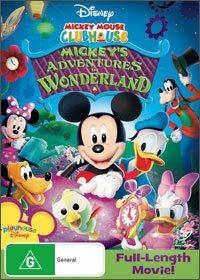 Through their adventures they encounter a variety of characters, including Minnie, Goofy and Pluto and there's even a cameo from those pesky singing chipmunks. Primarily an educational show, it covers topics such as basic maths, telling the time and the recognition of animal sounds. Mickey frequently directs these specific questions at the audience, inviting them to become involved. It's more or less spoon-feeding, but as such is suitable for ages 2 and up. Anyone over the age of about 6 or 7 is probably going to find these elements a bit condescending. This 48 minute episode of Mickey Mouse Clubhouse is enjoyable and inoffensive. The songs are amusing, the content educational and the animation, while pretty simplistic (this is not exactly Avatar), pleasant and full of bright colours. The only peculiarity are Mickey's ears, which seem to only be two dimensions and are always facing the screen head on. From the side he looks like a shark with a deformed dorsal fin. Still, the target audience are hardly going to be bothered with such details. There are a two special features including a full 23 minute bonus episode entitled "Goofy Goofy Goofy" and an "Adventure mode" where viewers use their DVD remote to answer Mickey's 4th-wall directed questions. It's not exactly a shade on the classic Disney cartoons, but it's not meant to be. Adventures in Wonderland is both informative and entertaining and recommended for its target audience.